Post #EqualPayDay Social @ 4/10 @ 2pmE, join @EqualPay2dayOrg @CAPWomen @nwlc @AAUWPolicy & electeds like @RepLawrence on http://facebook.com/americanprogress @ 4/10 @ 4pmE. We'll #talkpay gender #wagegap & solutions, like #paycheckfairness. It's #Time4Transparency! It's time 4 #equalpay! Almost eight months ago, the Office of Management and Budget (OMB) issued an immediate stay on the U.S. Equal Employment Opportunity Commission (EEOC) requirement that businesses with over 100 employees collect pay data by gender, race, and ethnicity. In response, the National Women’s Law Center, the Labor Council for Latin American Advancement, and Democracy Forward sued OMB to lift the stay and allow the EEOC to reestablish the equal pay data collection. Together with many coalition partners we also collected thousands of petition signatures urging the EEOC to move forward with its mission to prevent, stop, and remedy unlawful pay discrimination through a revised pay data collection proposal. We’re well into 2018, and while OMB’s stay remains in place, it’s now incumbent upon the EEOC to craft a new path forward. One of the best ways to ensure equal pay is to increase transparency around pay and ensure race and gender wage gaps can’t be hidden under the rug. This April 10 a large coalition of equal pay advocacy organizations will observe Equal Pay Day – the symbolic date representing how far into the current year women have to work in order to catch up to what men were paid by the end of the last year– by gathering outside of the EEOC to urge the agency take concrete steps to move the equal pay data collection forward. We will deliver thousands of petitions to the EEOC and hold a rally that features the voices of those most impacted by the wage gap. The petition delivery and speaking agenda will begin at 9:00 AM in front of the EEOC. Congresswomen Rosa DeLauro and Brenda Lawrence and Represenatives from Equal Pay Today, Center for American Progress, American Association of University Women, and National Women's Law Center hosted a Facebook Live on Equal Pay Day 2018. 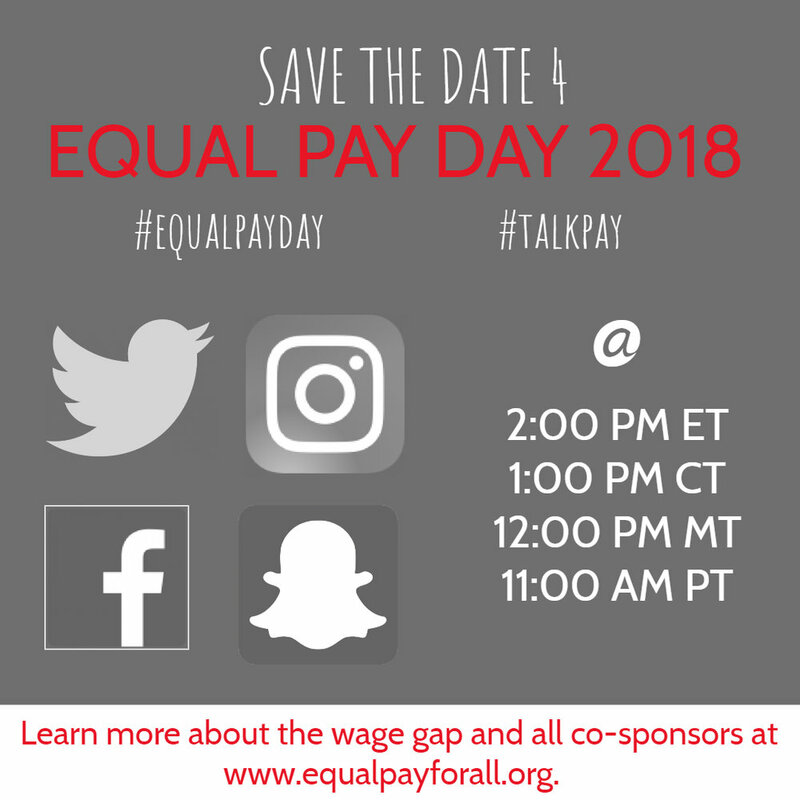 April 10, 2018 @ 2:00 pm ET/1:00 pm CT/12:00 noon MT/11:00 am PT, join us on Twitter, Facebook, Instagram, and Snapchat at for a Equal Pay Day Social Media Storm, using hashtags #equalpayday, #talkpay, and #time4transparency. Please promote via social media. Women’s wages fuel our businesses, economy, and most importantly -- many working families. That’s why MomsRising teamed up with Main Street Alliance to mark equal pay day with a fun and high-impact gimmick. Over thirty coffee shops and other small businesses will be using our custom coffee sleeves and napkins on April 10th -- Equal Pay Day, the day when ALL women’s wages catch up with what men made in the twelve months of 2017 alone. Learn more including a list of participating coffee shops here. Need an #EqualPayDay Primer? Hangout w/ @EqualPay2dayOrg @CAPWomen @nwlc @AAUWPolicy @NPWF on http://facebook.com/americanprogress Tmr, Mon 4/9 at approx 2 pm ET. We'll #talkpay & give deets on the gender #wagegap & solutions for closing it. It's #Time4Transparency! It's time for #equalpay!